With a looming deadline, you finally get that long-waited email from a manager who was going to look over the latest draft of your contract and make some revisions. As you open the Word document named “Government Bid v10 DDedit9 revisedFinal Final_Final.doc” you’re wondering what version you’re really working on and if everybody that needed to review the doc actually did. You’re hit with a visual overload of strikeouts in every color of the rainbow from the long list of reviewers. Still, you race to process all changes and once you’re about to send out the “final version” of the contract, you get an email from your manager’s boss with a series of must-include clauses in a document that includes “v4” in its name. Sigh. The good news is there’s a better way. It’s possible to track changes in contract management without going insane. Here are five best practices to make it a reality. It may sound like a good idea to include all information regarding a contract in a single unit, however, that practice may become a time bomb. Take for example, when Unix seller SCO Group unwillingly revealed that it was prepping a lawsuit against Bank of America when it didn’t properly used the invisible electronic ink feature of Word. It’s essential to have the right context when revising the latest draft of a contract, but it’s equally important to be able to protect confidential information. 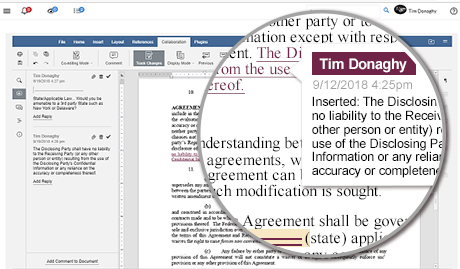 For example, you can use role-based permissions in contract management software to keep a layer of separation between for-your-eyes-only comments and contract drafts. A great way to prevent “Final_Final_Final_ReallyFinalThisTime.doc” syndrome is to limit access to a document for a period of time. It may rub some people, particularly top-level executives, the wrong way but it can give much-needed breathing room for everybody involved in a multi-authored contract. Ceteris paribus or “all or other things being equal or held constant” is critical to let an author finish their revision faster. Ideally, you can use a digital tool that blocks access to a document when somebody checks it out and that enables access once the revised draft is checked back into the system. Contract management software allows you to customize the steps in your contract lifecycle, allocate team members to projects, and assign tasks accordingly. This allows you to take the guesswork out of your contract processes and clearly establish the what, who, when, and where of each step in the contract lifecycle. Not only will this give you more visibility into where contracts and associated tasks stand, it will help improve your workflows by identifying problem areas. Instead of forcing every employee to keep his own Franken-spreadsheet or repository of contract spreadsheets and clauses, a better idea is to centralize your company’s library of pre-approved contract templates and clauses. This way you can ensure that everybody is operating with the most up-to-date document formats and legal language. Learn from the data entry error that took place during the 2012 London Olympics. By incorrectly inputting that the remaining available tickets for an event were 20,000 instead of the actual 10,000, a clerk created a loss and PR nightmare. There are two easy ways that this data entry blunder could have prevented. First, the process could have been automated. Why did a staff member have to manually input the remaining number of tickets into a spreadsheet rather than the system automatically calculating that number? This is a clear example of why contract management benefits from automation. Second, a contract management system can indicate when language deviates from a pre-approved range. Imagine the usefulness of being able to know who made the change, when the change took place, any deviations from pre-approved language, and why the change was made. Such documentation can be automatically sent to the right person to determine if the change is valid. Tracking changes is an essential part of contract management. Without an efficient process, an organization can burn through available hours for any project. By leaving confidential information outside of a document, using a check-in/check-out policy for revisions, increasing visibility of the overall change process, centralizing access to contract templates and clauses, and keeping contract language within pre-approved ranges, you’re taking important steps in making your track management better.